The Guardian Fire Shield provides an auto fire suppression solution for the home that goes off at 57° C. The product provides coverage for key fire suppression zones within a home. Most homes will have a min of 4 potential zones in one dwelling. These fire suppression zones include, basement suites, kitchens, bedrooms and outdoor patios, which increases the potential exponentially. Guardian Fire Shield can be placed virtually anywhere fire protection is needed, without expensive plumbing or installation costs. Great for garages, cottages, barns, outbuildings. Guardian Fire Shield also has applications in supporting auto fire suppression in commercial property spaces. It works hand in hand with existing sprinkler systems already installed in facilities, since it is activated at a lower activation temperature, and can eliminate costly water damage to commercial properties that occur during a sprinkler activation. 1. Find location in ceiling between joints. 2. Trace 5 3/4" hole (template provided) and cut with drywall saw. 3. Slide Guardian Fire Shield into hole, turn 2 locking screws. Institutional & Government Buildings. This includes US Armed Forces, schools, hospitals, police and fire hall stations, municipal city halls, etc. Commercial Property, including offices, restaurants, retail space, etc. Independently tested to provide effective fire suppression in at least a 16'x16' area. Since cold temperatures don't affect performance, the Guardian Fire Shield is perfect for the use in outbuildings of all kinds (no power is required either). The dry-chem agent used in the Guardian Fire Shield is safe when discharged, as it is essentially a form of baking soda. Installation couldn't be simpler. A 5 3/4" hole can be cut with a regular hand-held keyhole saw, and the Guardian Fire Shield slides easily into this hole between joists. 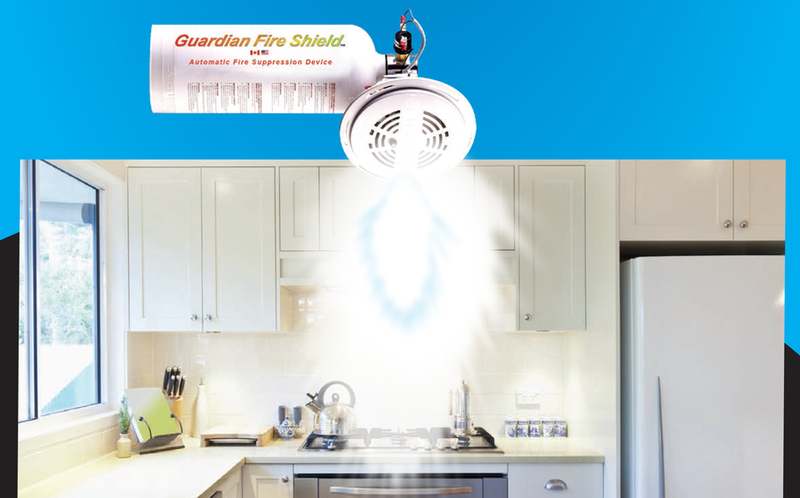 Unlike water suppression, the dry chem agent in the Guardian Fire Shield does no damage whatsoever when discharged. You are protected with our 1-year limited manufacturer warranty. We stand behind our products. Left alone, the Guardian Fire Shield can protect your loved ones and your valuables for 5 years (not including battery replacement for testing purposes). The heat-activated trigger means the Guardian Fire Shield will not discharge in the presence of smoke. It must be extremely hot (i.e. a real fire) in order for the unit to automatically discharge. The super-fine ABC dry-chem agent inside the Guardian Fire Shield cleans up easily with vacuum in the event of a discharge. Similar to: Fire Extinguishers, Class ABC, Badger Fire Protect, Buckeye Fire, First Alert, Haven, Kidde, Smoke Detector, Fire Suppression, Fire Gone, and Amerex. 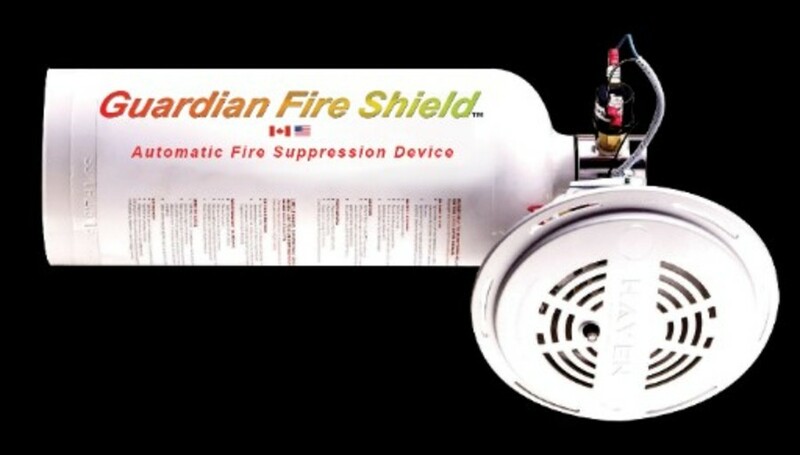 The 628504236031 Guardian Fire Shield is a stocked item and ready to be shipped to you today.